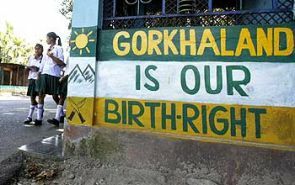 A Gorkha Janmukti Morcha supporter attempted self-immolation in Darjeeling as the indefinite bandh by the GJM for a separate Gorkhaland entered the sixth day on Thursday, even as the West Bengal government said it would follow court orders strictly to maintain normalcy. The GJM supporter, Purba Sherpa, a 32-year-old physically challenged person, who was in a procession set himself alight near the Chowk bazar, police sources said. The other GJM supporters hastily put out the flames and rushed Sherpa to the DarjeelingSadarHospital. Sherpa sustained 55 per cent burns, the sources said.